I bought a pair of percussion turnoff pistols at the Birmingham Arms Fair because they looked pretty and in need of a bit of TLC, I also got a box that fitted them as pairs were sometimes boxed. When I got home I found I had a barrel key that fitted, but couldn’t unscrew the barrels easily so sprayed Plus-Gas around and left it for a day or so. Still couldn’t get them off so thought I’d better apply some heat, but in an uncharacteristically sensible moment I thought to check that they were not loaded. One was – I could see the lead ball. 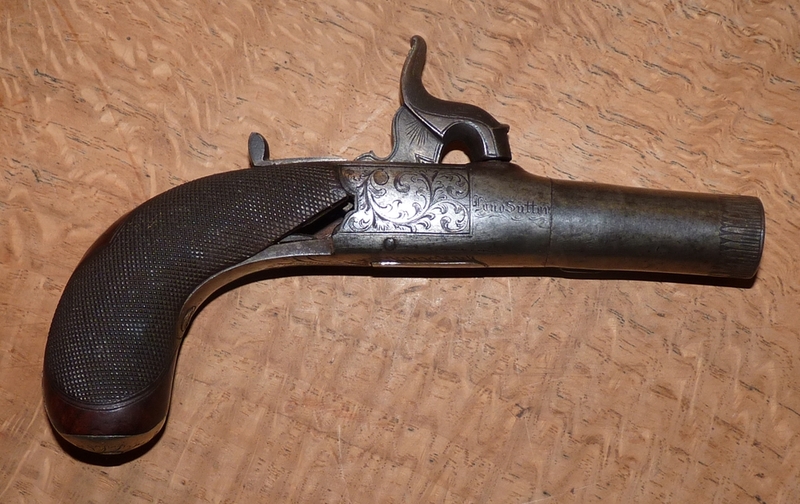 The Plus Gas prevented the powder from going off, so I drilled out the ball and poured out the damp powder which fizzed when lit – so the gun had been loaded since it was last used – probably in the mid 1800s – some 160 years ago! See the finished boxed set…….